Boyaa Interactive announces its 2019 BPT Asia: Competition and fairness at its best! This year's BPT covers many countries and regions in Asia with a guaranteed prize pool of $5 million NTD. Online qualifications tournament will be launched in mid-April! Once more, Boyaa Interactive keeps innovating and achieving new breaktroughs in the world Texas Poker —always striving to bring the ultimate game experience! Boyaa Interactive was founded in 2004 and listed on the HK Stock Exchange in 2013, becoming a global online board&card game company. It is also the owner of the popular Boyaa Texas Poker game, which has nearly 300 million registered accounts. 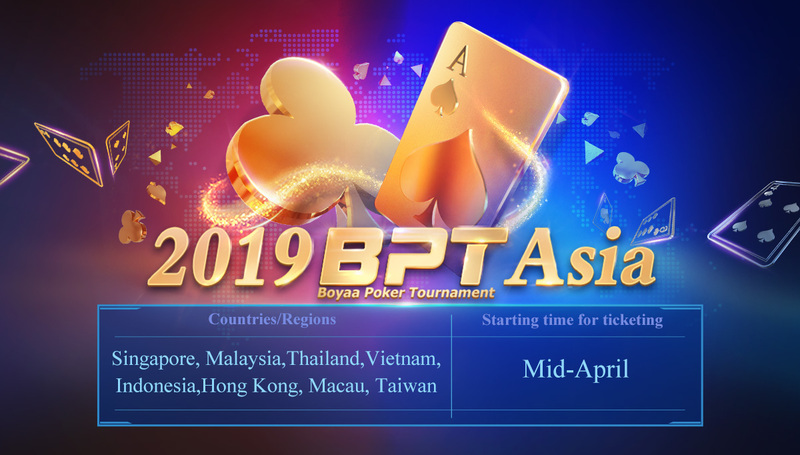 Boyaa Poker Tournament ( BPT ) is an annual event that started in 2015 and which, since then, has become the most influential poker event in the Asian region.